Why Did I Choose You Need a Budget? Of course, You Need a Budget is not the only budgeting app that exists. I recall looking around at a few different options before settling on YNAB. They have tons of free online workshops you can sign up for to learn more about budgeting and how to get the most out of your YNAB subscription. 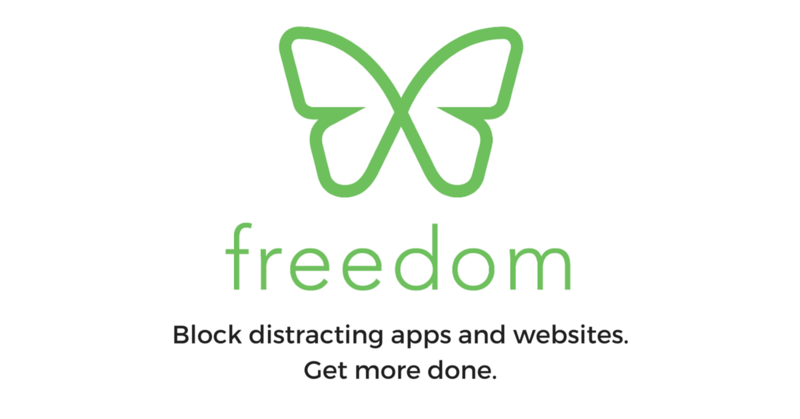 You also get a 34-day trial for free, during which you receive emails every day with new tips and tricks for using the app. I really like their features, which include customization of your budget dashboard, syncing different financial accounts (bank accounts, retirement accounts, credit cards, etc. ), a mobile app, and reports to monitor your spending. Plus, they have a blog where they post articles about all different kinds of budgeting topics. What I’m getting at here is that the team at You Need a Budget is trying to set up their users for success. There’s no shortage of resources for you to access to help you better understand how to use the app and to make a successful budget. What Kind of YNAB Accounts Do I Have? Personally, I have two YNAB accounts: a personal account and a business account. I signed up for the personal account first, and that was a learning curve for me. 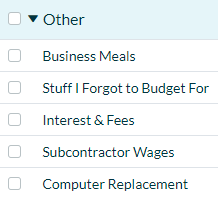 It took me quite a while to really customize my budget dashboard to have categories and line items that are actually applicable to me and my life. (But, that totally might have just been me being dense, because it took me a long time to realize that I could, you know, delete categories and line items that didn’t apply and replace them with new ones that do apply.) Like I said above, budgeting doesn’t come naturally to me, so it took a lot of trial and error for me personally to get things right. Plus, I use a credit union for my bank, not a large national bank, so sometimes there were syncing issues that took a while to sort out since my small credit union wasn’t as high priority as a national bank – not as many customers banking there in comparison. Then, my credit union revamped their online banking website, and that took a while to sort out with YNAB, as well. However, the support team at You Need a Budget was friendly and professional every time I reached out to them about a syncing error. They always responded to let me know what was going on and gave me updates about how progress was going for their development team to reestablish the sync. I just recently communicated with their support to help me figure out an issue, and not only did their support representative answer my question but she also provided an example to teach me why this issue this happened. Anyway, I’m digressing. 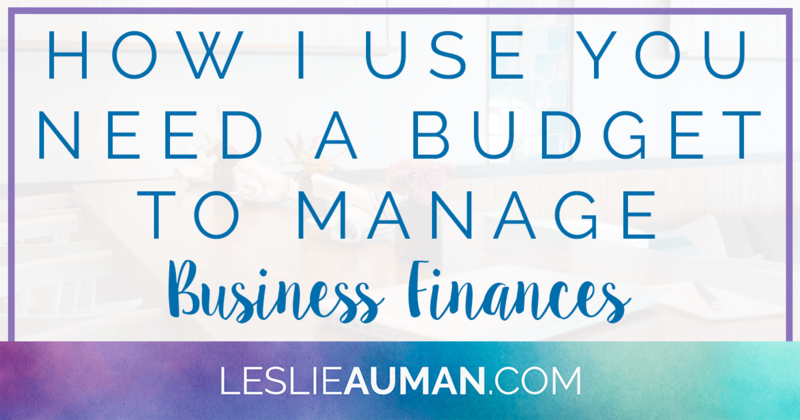 It took me a while (like…a few months), because I wanted to make sure I really understood how to use You Need a Budget on my personal account before I created a separate account for my business finances. I considered having all of my personal and business bank accounts in one YNAB account, but I thought that might get confusing for me to keep track of everything, so I personally decided that separate was better for me. 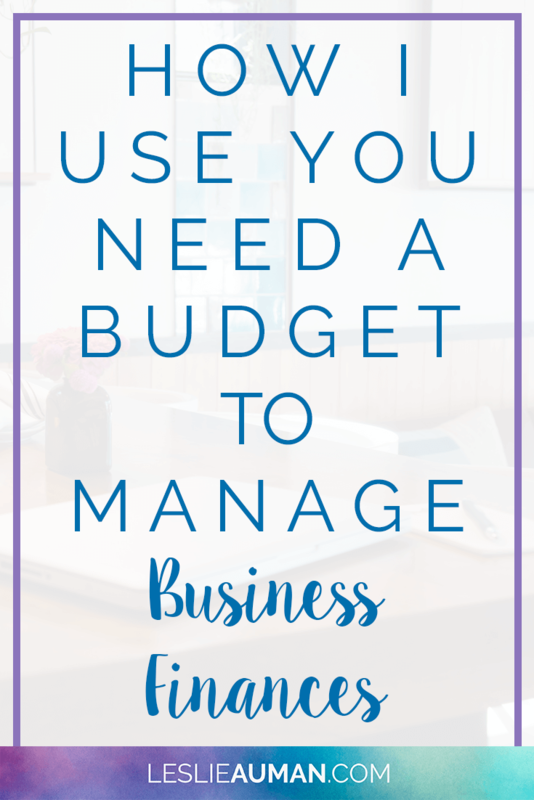 How Do I Use You Need a Budget to Manage Business Finances? In my business account, I only have my business checking and savings accounts synced. I don’t have a business credit card, and I don’t have a SEP IRA or anything like that where I pay into it from my business bank accounts. So, it’s just those two, and I try to remember to login at least a couple of times every week to sync any new transactions and make sure I’m on track with my budgeting. Below are screenshots of my budget dashboard so that you can see the categories and line items that I personally have set up in my YNAB account for my business. The light blue lines are the categories, and then the white lines with the check boxes next to them are the individual line items. I’ll go through some of the line items and explain what they mean for me below. Self-Employment Wages: I registered my business as a limited liability company back in December of 2016, but I still operate my business like a sole proprietorship. People who own LLCs can make what’s called the “S-election,” where they operate their business like an S-Corporation to get certain tax benefits. However, running your LLC like an S-Corp means that you have to do things like payroll and payroll taxes, which you don’t have to do when you continue to operate like a sole proprietorship. So, this line item is literally just me paying myself by transferring money from my business checking account to my personal checking account. Quarterly Estimated Taxes vs. Savings for Estimated Taxes: I’ve written before about paying quarterly estimated taxes when you’re self-employed. The “Quarterly Estimated Taxes” line is used when I actually make my online payment via EFTPS to the IRS each quarter. The “Savings for Estimated Taxes” line is used throughout the quarter to keep track of how much money I’ve moved into my business savings account to save up to make that quarterly payment. When the time comes, I move the money from “Savings for Estimated Taxes” to “Quarterly Estimated Taxes.” I could (and probably should) just have a single line item for this, but…oh well. Buffer Money: I try to keep a little bit of buffer money in my business checking account just in case something unexpected comes up. Professional Services: This is the line I use when I have to pay my accountant for her services or when I need to make payments for things related to my LLC. Gifts vs. Thank Yous for Client Referrals: I occasionally buy gifts for business purposes; for example, I’ve been working on little packages to send to my three mastermind group members. I used to mark any e-gift cards I sent clients to thank them for sending new clients my way as “Gifts,” but my accountant advised me to mark them as “Marketing and Advertising” instead, which is why that line item is in a different category. Software – Monthly and Software – Annual: As you can see, I have several online subscriptions to various online tools that I use to run my business. For the monthly subscriptions, I just keep that money in my business checking, but for the annual subscriptions, I have goals set in YNAB for how much I need to set aside each month in order to have the full renewal amount available when the time comes for the annual renewal. Then, I move those funds each month to my savings account, and when it’s time to pay the renewal, I move it back to my checking to make the payment. The trick here is to always mark everything as the same category/line item when moving the funds back and forth between accounts so that you don’t lose track of it. Business Meals: I don’t do much with this, but I should have a whole category dedicated to business travel expenses, which is where “Business Meals” could live instead of in a generic “Other” category. Currently, the only business travel I’ve done is to attend the Teachers Pay Teachers annual conferences, which is why I have the “TpT Conference Savings” line item right now (and all of the expenses I’ve made so far and all of the money I’ve saved so far to attend this year’s conference are attributed to that line item). But, if you do go out to lunch or something with the intent of having a business meeting while doing so, then that counts as a business expense, and you should be paying for it from your business bank account. Everything else is pretty self-explanatory, I think, but if you have questions, do feel free to leave me a comment on this post and ask! I don’t actually use most of the line items regularly, but I have them for when I do have expenses that fall into those categories. 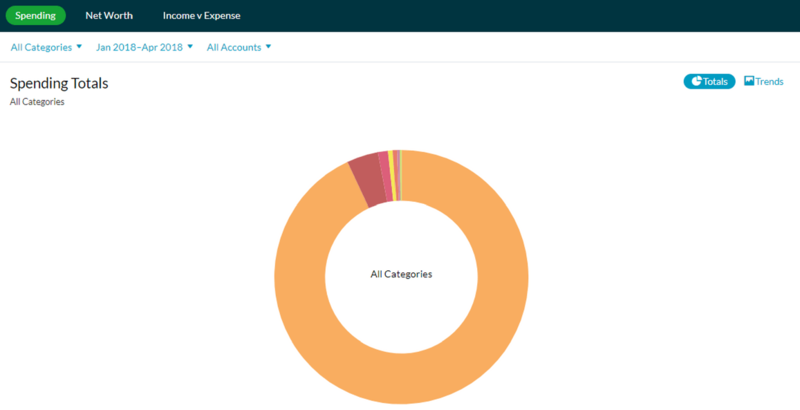 One last thing I want to note is that in addition to being able to customize your budget dashboard with both new categories and new line items, you can also click and drag both categories and line items around to put them in a particular order. You can even click and drag line items to completely different categories. How Can I Look at the Bigger Picture of My Business Spending? You Need a Budget has a Reports tab where you can look at reports for your Spending, your Net Worth, and your Income vs. Expense. You can set each of these for specific time periods to see how you’re doing in a given month, quarter, or whatever time period you’d like to analyze. These reports can be really helpful in figuring out where you’re doing too much spending where you don’t really need to be spending, and it allows you to toggle between looking at totals and looking at trends. I particularly like looking at the Income vs. Expense report because it’s kind of like a profit and loss report in that it tells me if I’m earning more than I’m spending in a given month (but it’s always a bit off-putting in the months where I have to make my quarterly estimated tax payment to the IRS). Below is a screenshot of my Spending report for all of 2018 so far, and below it is the key for the categories. 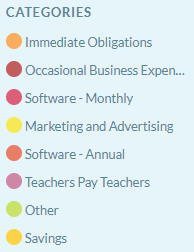 As you can see, the great majority of my spending goes to my “Immediate Obligations” category – my self-employment wages, health insurance, quarterly estimated tax payments, etc. (Note that I blocked out the total amount spent, which is below the “All Categories” text.) But, it’s helpful to keep an eye on this to see where I’m doing spending where I shouldn’t really spend. For example, it’s not uncommon for Teacher-Authors to realize that they’re spending way too much money on clip art and fonts for creating resources, but that’s not always beneficial for them – as in, they may not be earning enough back on the products using those clip art and fonts as compared to what they spent on them. This is why the Spending report is so helpful. 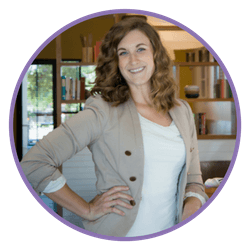 I’ve written about business finances in the past, so click here to check out that post, too! Do you use YNAB? If not, how do you budget for your business? I’d love to learn how you do it, so leave me a comment! *Note: This is not a sponsored post, but I do recommend YNAB to others. If you sign up for a YNAB account using my referral link in this post, then I will receive a small commission.